Busy Frugal Family: Preparing the Next Generation of Familypreneurs! Want to teach your children entrepreneurship and financial literacy skills, but don't know where to start? Then let's get some advice from Familypreneur author Jean Pierre Rukebesha! 1. Why did you write Familypreneur? First, I wanted to share with parents especially those running their small businesses how they can nurture and educate their children from any early age the basics of entrepreneurship and along the way get the kids to have a keen interests in what Mom and Dad do and how it contributes to the overall family wellbeing and financial stability. Second, the role of small business in the nations' economies and value creation is in general understated. When you turn on your TV or any media talking about business, all what you hear is about the big corporations in oil and gas, banking or technologies and how their values have gone up on the stock exchange. This is strange to many people focused in the small business communities! Yet, small companies create on average 70% of the jobs every year! In other words, they are the biggest employer even those the head count is between 1 to 5 people. Third, job security is something in the past; people used to work for corporations, receive pension benefits and when they retire, their financial situation would almost be guaranteed for the rest of their lives. Small business do the same for the owners too! Not only their pay (5 figure salary is possible for a young adult joining his parents within 3 to 5 years, which is hard to achieve when joining big corporations). Fourth, job creation is at the center of each government; for start, why don't we try and keep those created in the small business community from generation to generation instead of stop and start we see every day (statistics show that 80% of new created business do not survive beyond five years). Fifth, as a business advisor, I have seen the baby boomers phenomenon where many small businesses are closing down because the owner is retiring or old and none of his kids is prepared to take over; one of the reasons is parents assumed that kids will eventually take interests in what they do! Meanwhile, parents provided the educations but never talked about the ups and downs of running the business to their kids at a younger age; by the time they are teenagers and parents are trying to introduce the entrepreneurship concepts, it is too late! They have made up their minds to move on! Even when kids venture in the outside world do not work out, it is always hard to turn their attentions to what their parents do because of the unknown. 2. Tell us about your business and family. I am an Accountant by trade focusing on advisory services. Beside my accounting practice, I co-own a Tour Operators company (we purchased it from a family which has owned it for 36 years - Rostad Tours Ltd), a kids playground (under construction - Luv2play Airdrie) and co-founded recently GN Compass, a fintech company in crypto-currency-backed loans. I am married with 3 kids (2 boys and one girl - age 11, 10 and 7). 3. Why is it important to teach kids entrepreneurship and financial literacy skills? If you look into the school curricula, entrepreneurship is never taught at a young age, not even mentioned for even curiosity sake; when we grow up, we find ourselves struggling to grasp the basic concepts of entrepreneurship! We just freeze and we think of business owners as those people who took on huge risks! On the other hand, jobs are never easy to find, let alone job satisfaction and possibility of realizing someone's full potential. When jobs are not coming buy, people turns into a survival mode where the next best option is starting something of your own - turn into entrepreneur! Yet, you have never been prepared. Equally, financially literacy are important to everyone's financial stability! At the end of the day, a financial planner will only implement what you sign off; the younger we are fully conversant and comfortable discussing the financial matters, the better we will be prepared to make sound financial decisions. 4. How can parents involve your kids in their businesses? 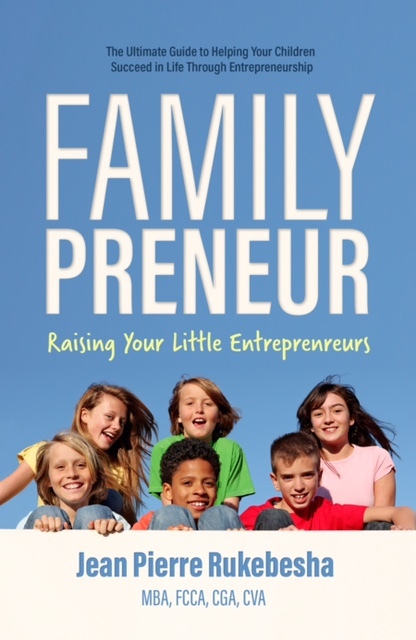 Familypreneur tagline "The Six Keys to Raising Your Little Entrepreneurs" explains what the book is all about. The book provides a guide to achieve the entrepreneurship mindset in kids; just like we teach our kids good habits, manners, the does the same by offering the inside on how that conversation can be introduced in every home around the dinner table. 5. How can parents help their kids get started as entrepreneurs? The book works as a guide; besides that, we learn best by trying things out. While the book offers many ideas each parent can implement, taking your kid on a job will work wonders. It is interesting that Bill Gates announced this week that he will invest almost $ 1.7 billion reforming US public education over the next five years (because the existing elementary school model is no longer relevant to the digital economy). One of the 12 modules of a future elementary curriculum would be organized around "Entrepreneurship & Sales." The book supports this future revamped education model. 6. Where can people go to get more information from you? Please also visit my website: www.familypreneur.net. What suggestions do you have for teaching entrepreneurship skills to kids?